Southeast is in the midst of its second Voluntary Retirement Incentive Program (VRIP) in three years after there were no plans for another one in 2017. A plan was originally implemented in 2017 with the intention of it being a one-time program, but a similar program is being executed in 2019. The program was discussed and got approval at the December Board of Regents meeting, vice president for finance and administration Kathy Mangels said. The program allows for faculty and staff who were eligible for normal retirement Jan. 1 to apply for VRIP, director of human resources Alissa Vandeven said. The application window was from Jan. 21 to March 7, and Vandeven said they have just been reviewed by Southeast president Carlos Vargas for approval. Thus far 54 out of 54 applicants have been approved to participate in the program. The applicants are now in the next phase of the program where they can choose to complete and submit a waiver and release form, Vandeven said, which is a legalized document for participating in VRIP. Vandeven said there are some differences between the program that occured in 2017 and the one in 2019. The 2017 program paid 35 percent of a faculty member’s base payment as an incentive for participating whereas the one executed in 2019 pays 40 percent of annual base salary. An employee’s base salary does not include any extracurricular activities the faculty member does such as teaching a summer course, Mangels said. Another difference, Vandeven said, is the wider timeframe of dates that are offered to retire under the program. “In the previous program the dates were within a 12-month period. In this program the dates are spread out over 18 months,” she said. When the first VRIP took effect in 2017, Mangels said there were no intentions to have a second program like it, but Southeast’s budget called for another. 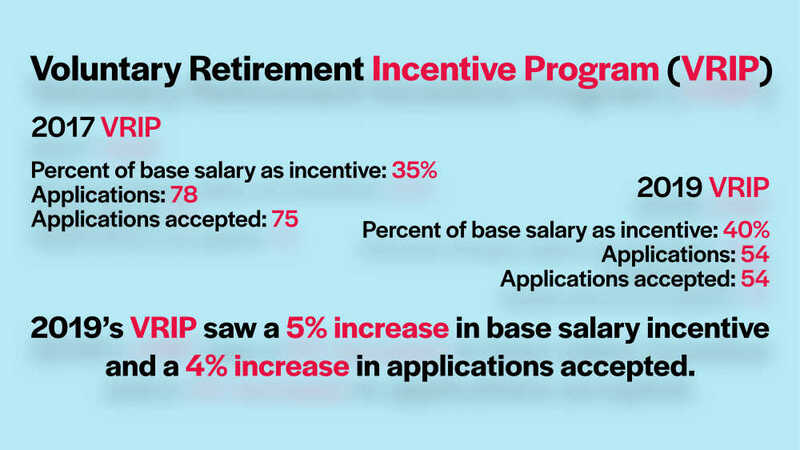 The money saved from this VRIP will go toward budgets for retirement contributions as well as salary savings if the positions get filled, Mangels said. There are no final numbers on the savings from the 2017 VRIP due to the last set of employees having retired in December, Mangels said. She said until those positions get replaced and the university knows what new salaries will be, there won’t be a final number. “For those [positions] who have been filled, and the majority have, we’re at a little over $1.5 million that it saved that went to budgets for FY18 and ‘19,” Mangels said. She said there has been no discussion of extending VRIP beyond 2019.